Once a Romanesque cathedral stood here, that was destroyed in the Crusades. In its place was built this Gothic Roman Catholic cathedral. 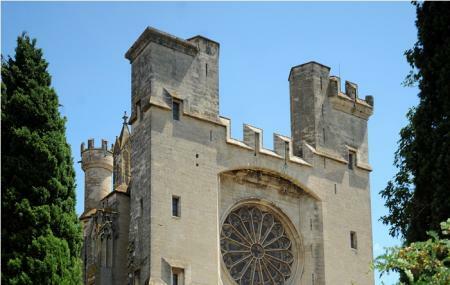 Large and imposing yet graceful, the Cathedral has a fantastic view of over three great bodies – Beziers, the Pyrenees Mountains, and the Mediterranean sea. The 17th century great organ. Definitely go up to the top of the bell tower for some fantastic views of the land around. The climb up the bell tower can be a bit of squeeze in 2 way traffic. How popular is Cathedrale Saint Nazaire? People normally club together Plateau Des Poetes and Polygone Beziers while planning their visit to Cathedrale Saint Nazaire. I don't think there is much to add to everything that's been written about this cathedral. Splendid and well worth a visit. I love old churches and cathedrals and St Nazaire is no disappointment and the views over Beziers are breathtaking. The highlight of any trip to Beziers is the cathedral. Originally built in the 10th Century the building was totally destroyed and rebuilt over many centuries until completion in the 15th Century. The inside is impressive, but the position of the Cathedral overlooking the Orb Plain dominates the horizon for many miles. Best viewed from the Pont Vieux or the gardens around the Eglise St Jaques. The views from the cathedral gardens over the lower city, the river Orb and the surrounding plain are also worth seeing. Visited the surrounding area. Was there on a Thursday in April. Was suppose to open at 14:30. We waited near the front door until 14:50 and it hadn't opened yet.